Building an online course with Coach is really easy. I wanted to give this withcoach review more stars. Maybe I will update the review in the future as more features roll out. This review is going to focus more on the tools and service itself (what you can and can’t do in Coach) versus the actual results and marketing that someone would do with their Coach course. Some of this data is a little off because I tested a lot of stuff in my account and had friends opt-in to see what their experience was like. Coach is a Saas (Software as a Service) for entrepreneurs who want to put a course online. I have tried using WordPress plugins, competitors software, and developing my own course building platform. Coach is by far the best solution that I have found. Some other options in this space are teachable, coursecraft, and udemy. Coach allows you to upload your course (video, files, text, images, etc) and automatically builds out your course for you. Who should use Coach for their online courses? Coach is perfect if you have some traction (maybe you have a decent sized email list) and are looking for a place to host your course so you can focus on other things. Coach courses require you to do your own marketing and don’t have a huge library of courses like Udemy. This can be a good thing because you can build the value of your course and get it in front of the right audience. Creating a course or project — It is nice that Coach allows you to create either a course or a project (like a download, think ebook). Adding files to a course – This is a pretty straightforward process. You can simply upload files (like text or pdf) and drag and drop video files which will be uploaded to your course. Design — The interface is beautiful and very user-friendly. It’s clear where everything is in your account and the dashboard does a great job of showing you the most useful stats every time you log in. You can see how many people have signed up for your course and how many have paid. Mine shows 0 because you can offer both FREE and paid courses. You can also have people “book” your time where you charge by the hour. This is shown in your dashboard as well. 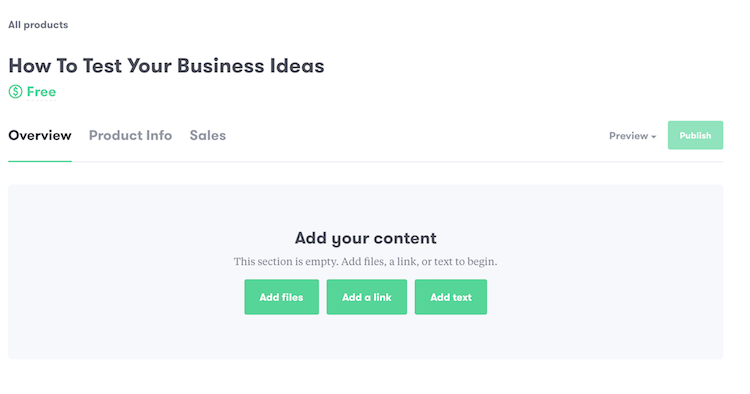 Pages — You can create custom landing pages for your courses within Coach. You can do this in other software services that help you build courses online but Coach makes it easy and effective by limiting your choices. Again, remember the angle Coach is taking is giving you less control over your design so you can focus on the course itself. The page builder gives you a few options like a headline, subtext, an image of your course and your call to action. The rest is automatically built. The page looks great and it takes a matter of minutes to create. Instead of messing with a bunch of design options you can launch a page and start promoting it quickly. Here is what my example course page looks like. Another nice feature of these landing pages for your online course is that you can see their conversion rate. This simple breakdown of data is nice and you can make multiple pages to see which messaging converts the best. 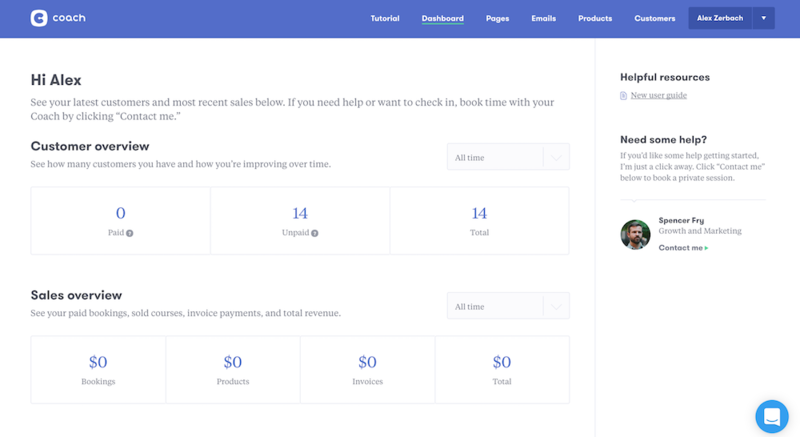 Payment methods – Right now withcoach allows you to integrate with Paypal (if you are on the premium plan) or Stripe. Email Campaigns — The basic coach membership costs $49/mo which is a pretty good deal for the course builder itself. 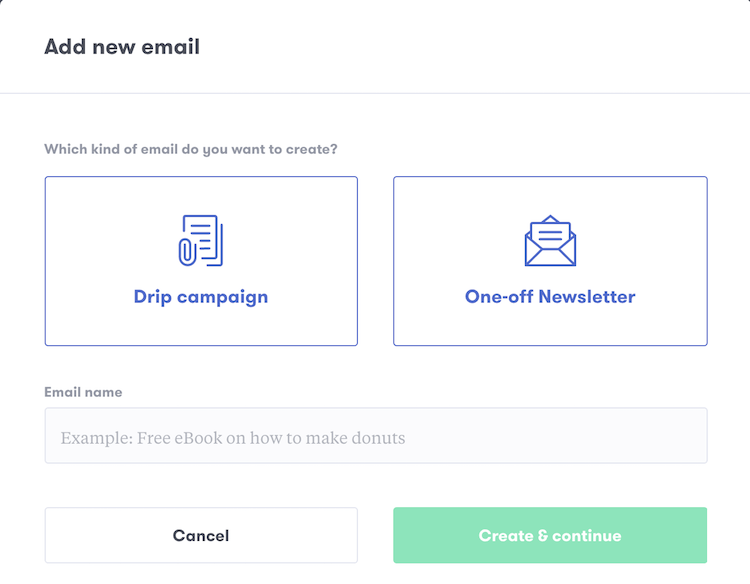 But they also allow for you to create drip emails (which are a series of emails that can educate or engage your subscribers.) You can also send one off campaigns to update users on the course changes, sales, or general FAQs. There are a ton of email services out there that do the same thing but having everything in one place is really nice. Again Coach makes it easy to manage the course and get out updates vs having to run around to 3 different places to use your course. Try getting email campaigns in your WordPress website. Support — The support that you get from Coach is outstanding. Their live chat window (they user intercom) is convenient and their responses are quick. Coach’s tutorial section has a lot of great resources, especially for someone who is just starting an online course (like how to control voice quality). One last pro about their support is their onboarding sequence. It’s really nice. When you sign up and start launching pages, products, and getting your first subscriber their email system kicks you emails congratulating you and giving you tips and links to resources that will help you on your next step. The cons of using Coach to build your course online is far less (hence the 4-star review). But nevertheless, there are a few things that I am not high on with Coach. Design Options — But you said this was a pro. It is until it isn’t. Hear me out. It’s really nice that Coach makes a nice looking course page and landing page for you. But I really wasn’t digging the purpose and gray combo they had. Plus the dark gray background with black text wasn’t ideal for readability. Also, I wanted to center the text on my landing page but wasn’t seeing an option for that. Course Creation Gotchas — Okay in all fairness this might have been my internet connection but it seemed to take a very long time to upload videos to the course. Of course, some of these videos are bigger files. Plus there is no indication if you can leave the page while it uploads or not. Also when I was working on the course I didn’t see a save button (it automatically saves your work) but having a save button would be nice so I know I can leave that section of the course and my work is going to be there when I return. I also which I could brand the course section a little different than the purple/gray combo. 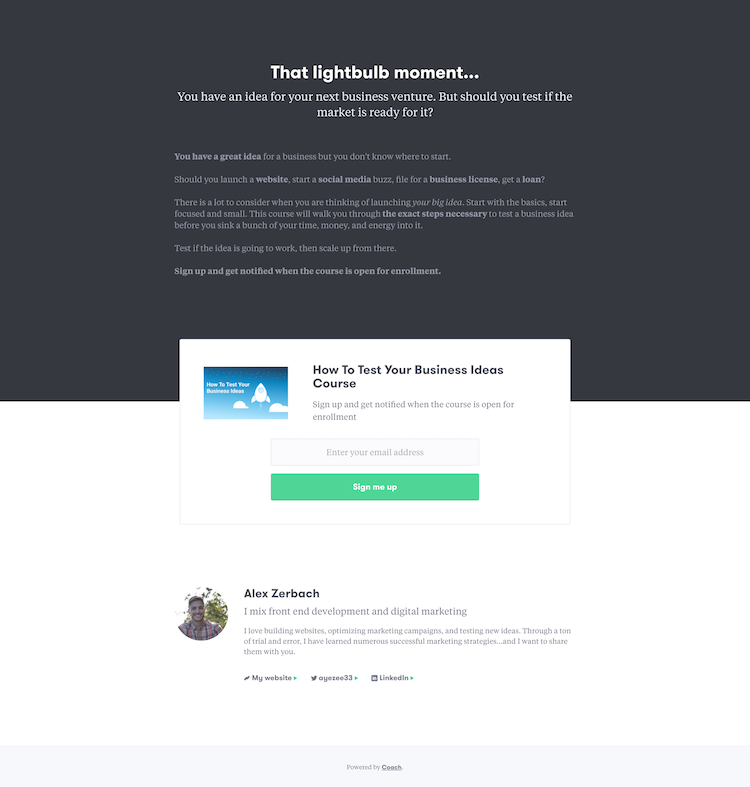 If someone comes from my site to the landing page or course, it just looks completely different. It would be nice if I could upload my brand logo somewhere and have some control over the branding experience. 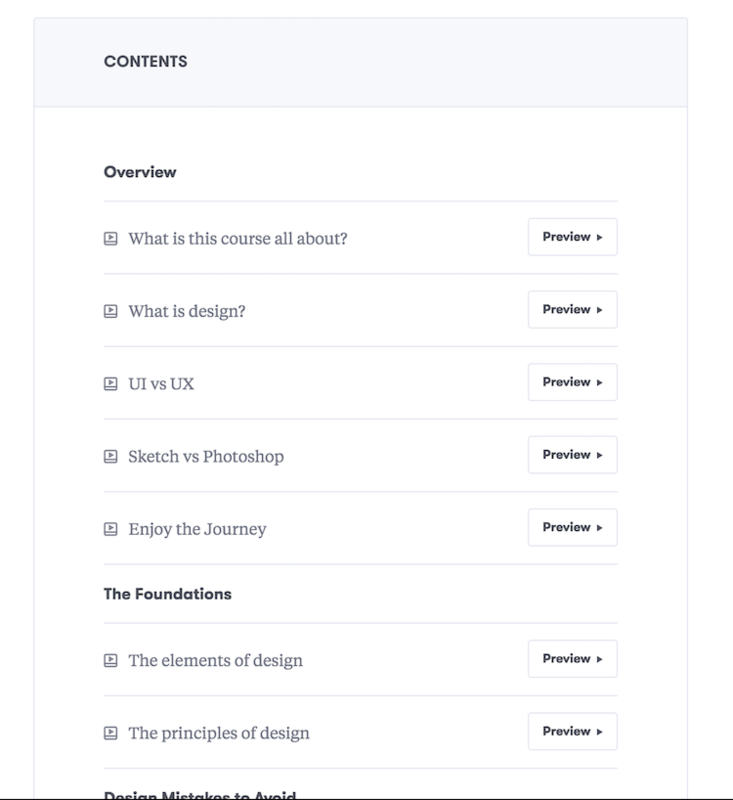 Tracking Links — Maybe this feature is coming, maybe it’s overly complex for the average course builder but I would love to be able to see where folks are coming from to get to my course page and landing pages. It would be nice to have the ability to add my Analytics code on the account so I can see if people are coming from a sidebar opt-in, an email, or SEO. The best features are for paid accounts – If you want to use a custom domain name or connect your PayPal account to take money you are going to need to step up and pay coach. Rightfully so, if they provide a service that is of value then you should pay for it. Although this isn’t really a con it can be prohibitive of someone launching their first course and trying to figure out the marketing side of it. I think withcoach is a great solution to the problem of wanting to create a course and focus on the creation aspect of it and less the tech and design aspect. The company is young, funded, and has an eye for design. I am sure the improvements I have listed above are coming soon. The real success of coach will come from how many course creators can use the service, make money, and promote the service.